Meg Murry has always felt like the odd one out. She’s bullied at school, teased by most everyone in the town, mostly the post woman. Here’s the thing, Meg’s father has disappeared and she hasn’t heard from him for years now. Meg’s life seems to be dragging along until one day Charles Wallace, her younger brother who is practically a genius, brings home an elderly woman called Mrs. Whatsit (that’s really what they call her, weird I know). Along with Mrs. Whatsit comes Calvin O’Keefe, a tall and lanky athletic boy who is older than Meg and lives with his crazy mother. Mrs. Whatsit, along with Mrs. Who and Mrs. Which (two other elderly women), take the three children, Meg, Charles and Calvin, and ‘tesser’ or wrinkle (travel) accross the 5th dimension to save Meg and Charles Wallace’s father who is trapped on Camazotz, a planet on which a mysterious evil force called IT resides. Throughout the rest of the novel, it’s a power struggle between IT and the darkness against the children, who have the fate of the Earth resting in their hands. To summarize this book in 6 words? Three kids tessering (time-traveling) to save Earth. I would give this book 8/10 stars because it is definitely one of the better books I’ve read. I started reading this book one afternoon as to humor my mom who had been wanting me to read it for years now, and once I got going, I couldn’t stop. My gut reaction to this book was: action and time travel, with a couple of totally awesome kids. 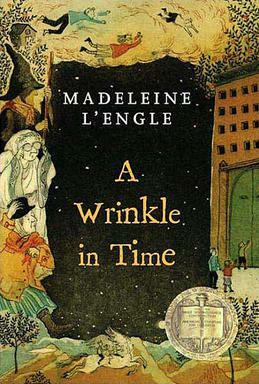 A Wrinkle In Time has a lot of action, but also has a lot insight and thinking required. It was a great read and the characters were well developed and had great dynamic. I loved the family dynamic between Meg, Charles Wallace and Mr. Murry. I loved Aunt Beast (read to find out more about her!) and the relationship between Calvin and Meg. I could not get enough of Mrs. Who’s quotes, they were one of my favorite parts! If Meg Murry was stuck on a deserted island, she would do a couple of things. Be annoyed, be stubborn, and then brainstorm an innovative way to get herself off of the island. In a yearbook, Meg would most likely be voted Most Stubborn, Charles Wallace would be Most Likely To Become President, and Calvin would be Most Athletic. This book was sort of a mix between The Spiderwick Chronicles and Anne of Green Gables to me, as odd as that sounds. Meg has the strong and stubborn personality of Anne Shirley from Anne of Green Gables and the adventurous aspect reminded me of the Spiderwick Chronicles. This entry was posted in Read This!, Teen Powered and tagged adventure, Book Reviews, books, classics, fantasy, lean mean teen reviews, Teen Book Reviews, written by teens on August 25, 2014 by Teen Blogger.